I've had a serious crush on Michael Bublé for quite awhile. Every time I hear him sing "Home" my heart just melts. He also sings the standards so well that he makes me think of other great, smooth crooners like Frank Sinatra. If you've never listened to any of his work, you really should. 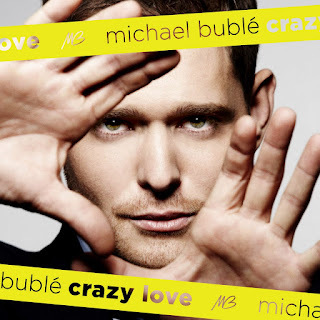 Given my love for him, I was naturally thrilled when the One2One Network gave me the opportunity to review his new album Crazy Love. All I can really say is that when I listen to Michael Bublé, I smile. I feel joyful. He brings a huge shot of happiness as he delivers a song. He makes me tap my toes, and smile, and dance around the house. How many singers make you feel joyful? On Crazy Love, he brings his smooth style and personality to original songs, as well as covering some wonderful classics. My favorite songs on the album are Crazy Love, one of my all time favorite songs no matter who sings it, and Haven't Met You Yet. My entire household has enjoyed listening to the album. Even the kids enjoy the soothing sound of Michael Bublé's voice. The only negative comment I've heard was from Dan, who insists no one should ever cover Eagles songs, but other than Heartache Tonight, he has liked the CD. To learn more about Michael and this awesome album, head over and check out his website. You can also check him out on Facebook. He is such a great singer, seems to have a great personality, and I would just sum him all up as a cutie ;-) I think he has an amazing talent and look forward to hearing more from him in the future. To give you an idea of how talented and just adorable he is, I've included the Crazy Love Album trailer and video for Haven't Met You Yet. Enjoy! Ramblings of a Texas Housewife Product Review and/or Giveaway Disclosure- I have received no compensation from One2One Network other than the offer of free product to review and/or giveaway. Any opinions expressed on Ramblings of a Texas Housewife are my own. My reviews are never reviewed or edited in any way by sponsors.